The author correctly identifies Obama’s science adviser as not being a scientist. By applying “ALL” known factors and combinations to their models the average of the ensemble runs would be a static future with overall ice neither increasing or decreasing during any long term period because anything can happen. By basing their research on a very short period of time the corrupt their research and look foolish to others. 31 years of records for the Arctic is half an eye blink of the regions history! A climatologist goes in for a hair cut and is wearing head phones. The climatologist tells the person cutting hair they require a hair cut but the head phones must not be removed under any circumstances. The person cutting hair gets to the point where every part of the head but that under the head phones is trimmed which would leave a really messy look and make the job look bad. The hair cutter thinking , what could it hurt removes the head phones. The Climatologist stops breathing and expires. The person cutting hair picks up the head phones to listen and hears: Breathe in, Breathe out repeated over and over. That only shows why they’ve been telling us all along that the situation is worse than was first imagined. You’ve been told of this all along only to ignore it but now you foolishly bring it up as if it supports your convoluted ideas when in fact it contradicts them. And the reason for that-not that you want to know-because they could not take all positive feed back loops into account. When they saw how the ice melt was proceeding more rapidly than calculations had shown, they took that into account.in their next prediction. Yet they underestimated the gravity of the situation again. So they’ve been wrong in a way that reinforces their basic premise. It’s melting, MELTING, MELTING. “What drugs are you taking? And don’t forget ice area. I’ve noticed that you rarely bring it up. I wonder why. Could it be because 2007, 2008 and 2010 (2009 being slightly lower) are the same? This year it looks like it’s going to be even lower. Of course I forget the “ponding” excuse. Never mind that 90% of the ice cap would have to be ponded in order to change the values by even a small amount. Do mind the fact that It’s another one of your statements that reinforces the reality of continued melting. In case you didn’t know it, one of the effects of ponding is to thin the ice as well as breaking it up into chunks. Those chunks are more vulnerable to melting. Here is the ice area graph. Maybe it will unclog, maybe it won’t. If, in fact, it does unclog, then we can certainly say that it looks pretty much like it did almost 80 years ago for tourist trips through it. Step right up, folks. Step right up and be a winner. It’s a simple game. Just keep your eye on the pea, watch as the modelers move it back and forth beneath the shells – and when they’re done, just point to the one covering the pea. Step right up, folks, and place your wagers. Be a winner! 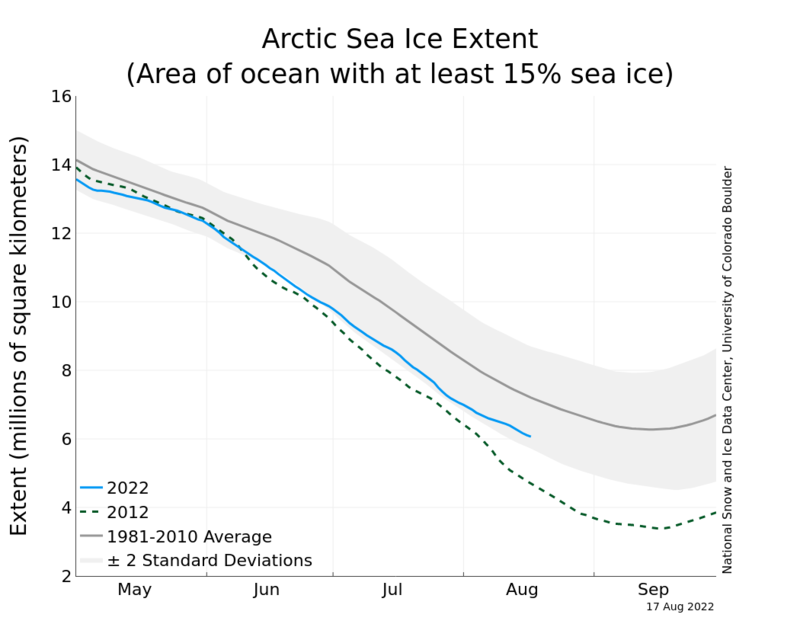 Arctic ice extent, still trailing 2006. News at eleven. There is just as equal chance that the amount of ice In the Arctic region will in fact increase during the coming years. The current state of knowledge and the models used to project possible future scenarios in the Arctic region do no better than random number generators and that is why they get different answers every time they run a model! Continued funding of NSIDC and other groups that are doing Arctic research is just throwing more money away. While it would be nice to have real time knowledge of the ice conditions from day to day these groups are not providing that. They are beating their drum making false claims about their value, just like a Snake Oil Sales Man. I feel that way about the entire climate charade because their results can be no better than the trash they use as a reference. As long as reports are based on current surface station records and what passes for paleo records they would be better off using a ouija board.